See more objects with the tag instruction, communication, screen, information, flat, innovative, keyboard, computing, knowledge. See more objects with the color dimgrey darkslategrey grey darkolivegreen or see all the colors for this object. This is a Computer. It was manufactured by Apple Inc.. It is dated 1997 and we acquired it in 2011. Its medium is plastic, metal, glass, leather. It is a part of the Product Design and Decorative Arts department. Industrial designer Robert Brunner was Director of Industrial Design at Apple Computer, Inc. from 1989–96, during which time he provided design direction for all Apple products, including the innovative PowerBook laptop and the Newton personal digital assistant. Brunner left Apple to become a partner in the international design consultancy, Pentagram, and founded the design firm Ammunition in 2007. 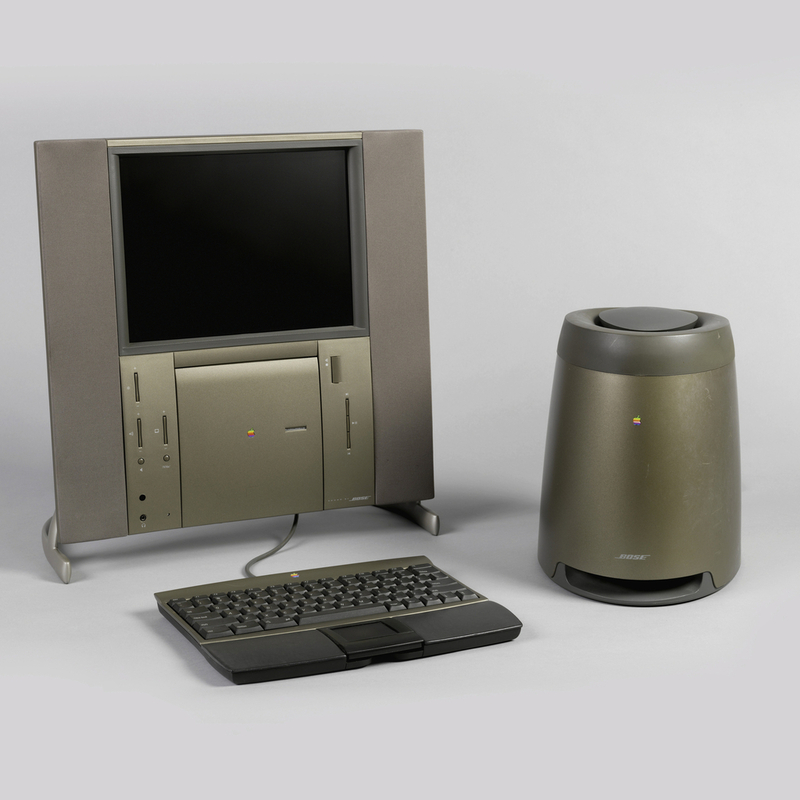 The 20th Anniversary Macintosh (TAM) was created towards the end of Brunner’s tenure at Apple. It was developed in only 12 months and introduced in 1997 to celebrate the 20th anniversary of Apple’s groundbreaking work in computer design. The TAM’s design departed from the standard beige or light gray boxy desktop computers and television-like CRT screens of the time. It was one of the first desktops to incorporate an LCD display. The TAM’s metallic gray color and a slim profile were designed to represent a futuristic vision that would appeal to business users and executives. The keyboard includes leather palm rests and a detachable trackpad instead of a mouse. When not in use, the keyboard can fit under the main unit. Buttons under the TAM’s screen control a CD player, sound levels, brightness/contrast, and even a TV mode. The power supply is a separate, contoured, columnar unit that also house a subwoofer, part of a custom-made Bose sound system for enhanced sound—a special start up chime capitalized on the sophisticated audio system. Originally priced at about $7,500, only 10,000 TAMS were produced. The cost included a personal concierge service that would deliver, set up, install software, and show the user how to operate the computer. Due to a lack of demand, however, the service was discontinued and the price fell under $2,000. Fourteen years after its debut, the limited-edition TAM has become very desirable among computer collectors. The TAM would be a fine addition to the museum’ s collection, expanding our holdings of late 20th-century industrial design and furthering our documentation of Apple’s highly innovative work in computer engineering and consumer electronics design. It is credited Gift of Bill Moggridge.